This award is given annually to an individual or individuals who make a legendary single, or longstanding multiple, contributions to the American Society of Ophthalmic Plastic and Reconstructive Surgery. This award is given annually to a member or Candidate Member who submits the most outstanding paper describing original research conducted in the field. Only papers submitted to Ophthalmic Plastic and Reconstructive Surgery, the official journal of the Society, are considered. Named in memory of ASOPRS Past President, Dr. Bartley Frueh, the ASOPRS Foundation gives the award to the best presentation from each morning's YASOPRS Eye Openers - Rapid Fire Cases and Presentations Sessions during the Fall Scientific Symposium. This award is given annually to an individual for longstanding contributions in the field of cosmetic surgery. The recipient of this award presents the Henry Baylis Lecture during the Fall Scientific Symposium. This award is given annually to an individual who has made an outstanding contribution to ophthalmic plastic and reconstructive surgery. The first award in 1974 was made to Marvin H. Quickert, MD, for his application of anatomy to surgical approaches. This best thesis award is an honorary award given annually for the most outstanding thesis submitted by candidates seeking membership in ASOPRS during the current year. 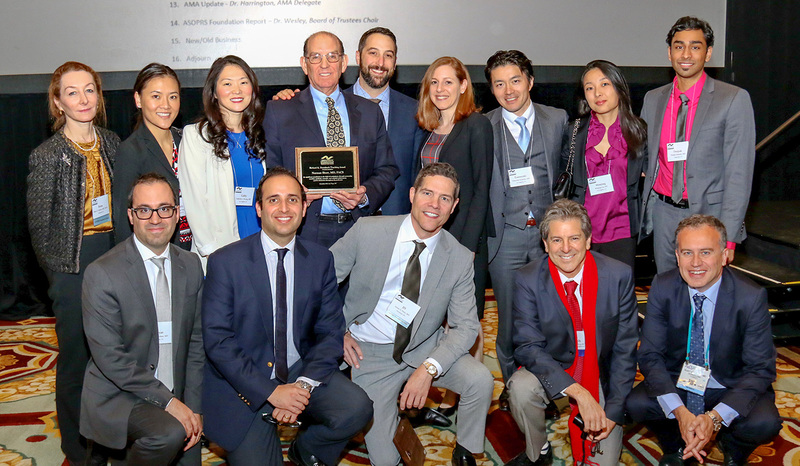 This award annually honors a paper considered to represent a truly significant contribution to the field of ophthalmic plastic and reconstructive surgery. This award is given annually to an individual who has demonstrated distinguished service in the field of ophthalmic plastic and reconstructive surgery through education, research, humanitarian activities or service to the Society. This award is presented in recognition of the leadership of ASOPRS charter member, Orkan G. Stasior, MD. Named in memory of ASOPRS 2007 President, Robert Kennedy, MD, PhD, this award is presented to the Society’s Immediate Past President in recognition of their devotion, leadership, and ongoing service to the Society. This award is given to an individual with significant contribution to the field of oculoplastics through outstanding teaching, academic, scientific, and scholarly achievement and for dedication throughout his or her profession. This award is given to an individual for longstanding contributions in pediatric oculofacial plastic surgery. This award is given to an individual, selected by the Wendell Hughes Committee, who delivers the prestigious named lecture in honor of Dr. Hughes, ASOPRS Inaugural President. An annual tradition since 1970, the lecture is delivered at the joint ASOPRS-AAO symposium during the American Academy of Ophthalmology meeting each Fall.